While patience is not one of the traditional biblical three theological virtues nor one of the traditional cardinal virtues, it is part of the fruit of the Holy Spirit, according to the Apostle Paul in his Epistle to the Galatians. It is misunderstood I believe. Often seem as the lazy man’s excuse, or that inaction is often better than action, it is more commonly associated with waiting. Waiting for things to happen. 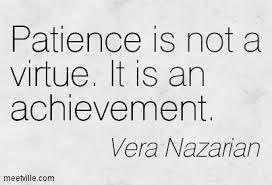 Patience has to do very little with sitting back and waiting for things to occur. It is actually about perseverance, and struggle. It has more to do with strength and will power than idleness and expectation. Patience IS the appreciation that things take time. Like a crop coming to harvest, you plant a seed, then cultivate and tend to the growth of the idea, until it reaches a point that you can enjoy the rewards of your labours. The mindset of the impatient, on the other hand, is to have someone else’s hard work and results handed to them without delay, and is a cultivated mindset of modern society. If you ask me, some people seem to regard impatience as a right. In fact, the culture of impatience seems to be so wide-spread and so deep, that I find people often react to a new idea with concerns that they won’t have time, because they are busy now. It’s almost instinctual to be thinking short-term, or with assumed impatience. And quite often, much of what we talk about and plan is short-term, so I guess presuming that would be natural. When talking about big ideas however, like starting a business, planning a holiday, a feature film, or web series. These things take planning, nurturing, and time. They are not going to spontaneously appear, which I would have thought was common sense, yet that does not appear to be the case. I have spoken with many fellow industry hopefuls about plans they have, and they have wonderful zeal, energy, and enthusiasm for some grand project they wish to see happen, but the stars in their eyes seem to dwindle when you explain things like cost, planning, drafts, reviews, and process. They want it all to simply happen. And I am not perfect. I occasionally get swept up in the thrill of an idea, and become filled with hope and dreams, but these are just the kindling for a bigger fire, which takes time to build, and effort to stoke. 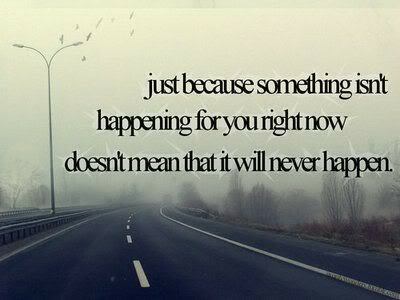 That’s where patience resides though. At the side of the fire, stoking and feeding it, keeping it burning bigger, and brighter, until the light it shines brings others in to bask in it’s warmth. Patience doesn’t let the fire go out. It means staying positive, hopeful, and industrious. In a way, it is about believing in yourself. If you don’t have the faith in yourself to achieve your dreams, then you won’t be able to find the patience for the work ahead. Patience is a choice. It is acceptance.